Results of Hair Transplant are very good for the Scars on the face in the hair-bearing areas like a moustache, Beard and Eyebrows. One of the most common causes of the scar on the upper lip is a post-operative scar of cleft lip. Even after repetitive surgeries for scar revision, it cannot be corrected 100%.In the area of the scar, hair cannot grow and this distorts moustache of a man. Now with the advances in the hair restoration surgeries, this can be very well corrected by hair transplant in the area of the scar. Hair root can be taken from the beard or scalp. If we take roots from Beard, FUE (Follicular Unit Extraction) is done by using very small size punch (0.75-0.8mm).Such small size of Punch leaves no scar on the donor area. From the scalp, Hair roots can be taken by both FUT and FUE. We generally prefer FUE as there is no need of suturing in FUE and this gives the impression of less invasive surgery to the patient. 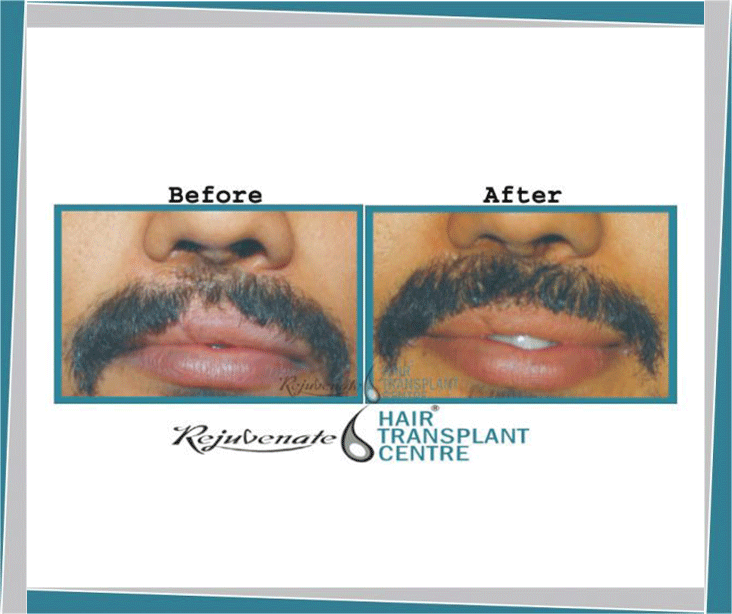 Here you can see the result of the hair transplant in a young patient with Cleft Lip scar, who has gone for three surgeries for scar correction, comes to Dr Anil Garg for his distorted Moustache and was very much disturbed because of this. We plan on Hair transplantation in the scar. Hair roots are taken from the scalp by FUE method. 250 grafts were taken and implantation is done. The procedure is done under local anaesthesia. A patient was very happy with the procedure. No extra precaution was needed in the post-operative period. He had resumed his work from the next day. Hair Transplant Result start coming after four months and the complete result takes at least 10 to 12 months. We can compare photographs of the patient before and after surgery, and can very well appreciate the difference. Such type of correction for the facial scar increases the confidence level of the person to a great extent.